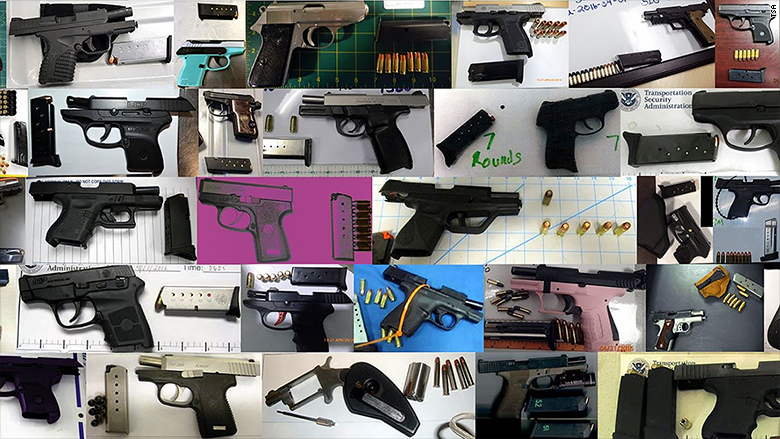 The TSA intercepted a record 73 firearms from airline passengers' carry-on bags last week. And all but five of them were loaded. That's the most guns the TSA has ever confiscated in a single week, surpassing the previous record of 68, which was set in October 2015. "Unfortunately these sorts of occurrences are all too frequent...each time we find a dangerous item, the line is slowed down and a passenger that likely had no ill intent ends up with a citation or in some cases is even arrested," the TSA said in a blog post Friday. People caught attempting to bring a weapon onto an aircraft face a fine of up to $11,000. The TSA said even novelty and replica firearms that look real are prohibited. BB guns, brass knuckles, ammunition, pocket knives, stun guns and batons are also banned. Passengers can travel legally with a firearm, but it must be unloaded and in a lock box, packed in checked baggage, and pre-approved by the airline.